Egypt is a large developing country with some of the most well-preserved archeological treasures in the world - a marvel to see. Unfortunately a high percentage of the people see tourists only as a short-term source of cash thus one of our less pleasant visits. It was truly awe-inspiring to visit one of the cradles of civilization, and to see many of the structures still in place and paintings still quite visible. 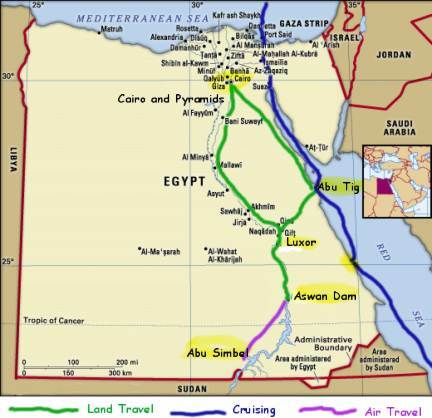 Egypt is a secular country and all religions are practiced although Islam is the primary religion of the Arab majority. Security is 'job one', and they go to a lot of effort to protect tourists (and their income stream). Such a history-filled country, such unpleasant people. Egypt is one of the few countries that we were happy to leave after enduring weeks of dishonesty and harassment by would-be merchants. The touts trying to separate us from our hard-earned cash were just too much of a nuisance. A cultural change might make this a country worth several trips, but their attitude has remained unchanged for hundreds of years, so is unlikely to change anytime soon. Despite this grousing, we did meet nice people and our guide on the Nile was world-class nice and helpful. Abu Tig is the premier (and almost only) marina in Egypt and was a welcome sight after the long slog up the Red Sea. The marina is a haven of civility in a resort, well isolated from the local towns. It is sheltered, is reasonably priced, has access to several good restaurants, has local shopping and shuttle buses around the multi-hotel complex. 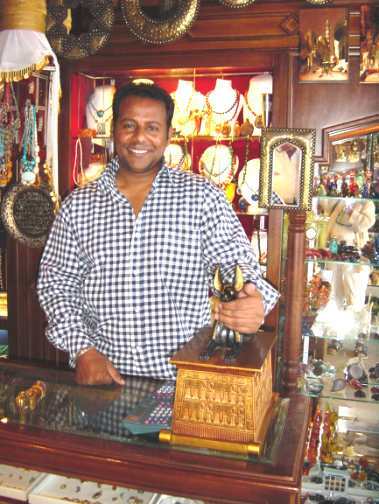 The nearby city of Hurghada has additional shopping and resorts, goods are cheaper but you need to be on your guard from merchants that will try to rip you off. The Cairo Museum - This is the premier museum for Egyptologists visiting the city. We found it too big to see in one visit, so spent 2 afternoons wandering through its wonderful and rather disorganized exhibits. The number of mummies, vases, carvings, statues, pottery, and coptic jars was mind-numbing and fascinating. The gold body ornaments of the Tutankhamen exhibit were amazing. 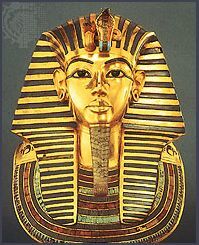 Since virtually all tombs of the kings have been raided over the years, the discovery of "King Tut's" tomb with its treasure intact was a real boon to understanding the wealth buried with the pharaohs. We learned a lot about Egypt and its history from this museum. The Pyramids - And of course, the 'coup de grace' of a visit to Egypt are these 4500-year old monuments to Egyptian civilization. Our first attempt to visit was aborted as a sandstorm hid them from view while we were only 200' away. On our second visit we walked around each of them in 33ºC (95ºF) temperatures. They demonstrate the length to which the pharaohs would go to insure their own comfort in the after-life, at the expense of the peasants and slaves who had to build them in this life. 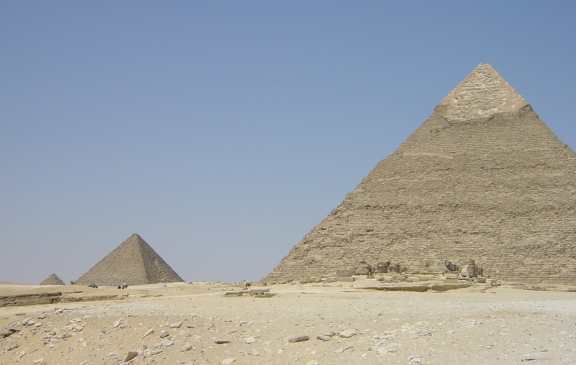 Khufu is known as the Great Pyramid (481' high) with Khafre, and Menkaure rounding out the three pyramids at Giza. They are magnificent structures and were glad to have had the opportunity to see them. 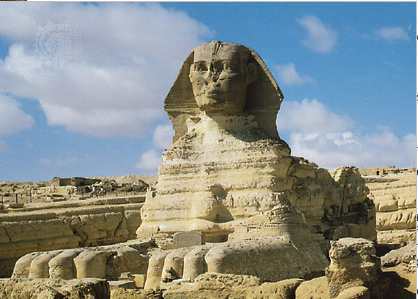 The Great Sphinx of Giza - The final icon of Egypt is the Sphinx, the man-lion sitting near the pyramids. With the pyramids sitting high on a hill the Sphinx seemed smaller than we had expected. Despite that, it was impressive with its royal face and giant paws looking hungrily over our shoulders at the KFC sign on the Cairo street behind us. 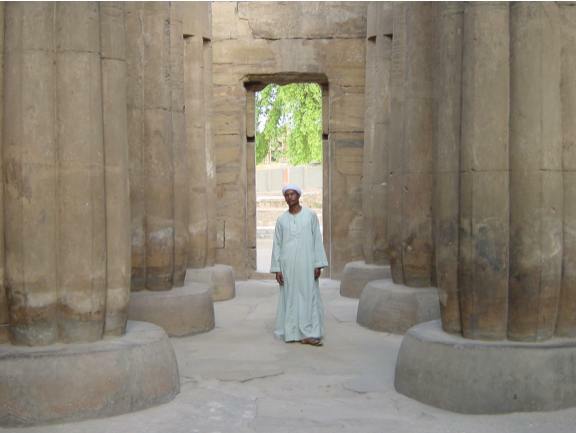 Luxor - We started at this city built around the remains of 4000-year old temples and statues. 18th century sketches show many of the temples almost buried in sand, which explains how some of the carvings have been preserved so well for so many years. Temples glorified Horus and other ancient Egyptian gods, described genealogies, medical information, calendars, number systems, and numerous other carvings. Huge columns and obelisks (those left after the European powers took their share back to London and Paris) graced temples and boulevards. Aswan - The floods of the Nile produced fertile soils and a surplus of food that allowed pharaohs to have temples, tombs, and pyramids built to sustain them in the afterlife. In more recent times the waters have been pacified by the High Aswan Dam, built in the '60's to smooth out the flow. The Nile valley remains fertile and green and is very productive and the dam built at a set of water falls is quite impressive. Abu Simbel - In Lake Nasser upstream of the High Aswan Dam, many archeological sites were drowned, but a few were rescued. 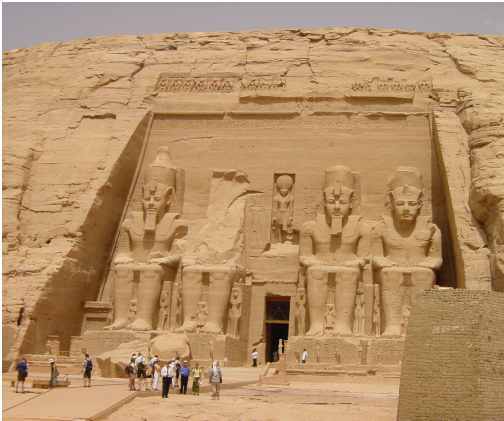 Abu Simbel was a tomb of kings and queens carved into the hillside with huge statues guarding the entrances. This temple was discovered in 1813, well preserved since much of it was covered in sand. The rising of the waters threatened to destroy the site and UNESCO paid to dismantle it and re-assemble it on higher grounds. Summary - We loved the history lesson to be gained from a visit to Egypt and it was worth the hassle imposed by the touts, but barely. We would be hard-pressed to return anytime soon. We felt Abercrombie and Kent was a 1st class outfit and would do business with them again anytime! For more details see our May 2003 Journal entry or move on to Cyprus - a stop we made on a friend's motor launch before our passage to Turkey.